When you put on these enormous boxing gloves and enter the ring, you can imagine yourself as a contender for the world title. 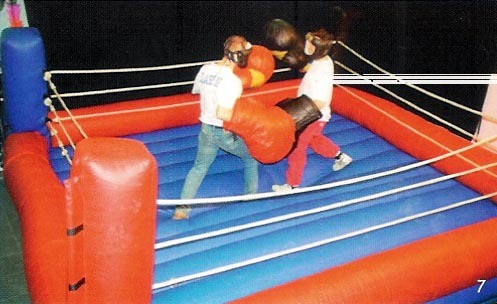 Two competitors climb into a brightly colored inflatable boxing ring and put on hilariously oversized, foam-filled boxing gloves. The contestants wear sparring helmets and try to knock each other down while trying to keep their balance on the safe, air-filled boxing ring.